Another day in the Nerdery... This bookcase sits directly behind my chair (in that if I get excited and wheel back I hit it - hard). I don't think any of this is nerdy at all. Correct me if I'm wrong. Okay - so what are these two shelves all about. On the top we have Stephen King's 'On Writing' of course, and the 'Complete Works of Shakespeare' (and though the bookmark 'the purple tassle thing' appears to be at the end of the book, I have so not read that much). On top of the book marked 'Animal' we have a collection of SFX magazines all dedicated to Buffy the Vampire Slayer - so we're getting a little bit nerdy I guess. On the shelf below we have Neil Gaiman's 'The Wolves in the Walls' - excellent PB, and 'The Annotated Fairy Tales' which I keep meaning to read. My house is full of books I haven't got around to yet. The other books are poetry / The Dictionary of Witchcraft / The Dictionary of Superstitions. Jeez, can you handle the excitement. Okay, this is my HUGE (ahem!) collection of screenplays. I will get around to finishing my screenplay some day. The unseen shelf below is full of dictionaries - ie of World Religions, of Slang, of Nursery Rhymes, of Saints, of English Surnames, English Place-Names, New Words, Idioms, Phrase & Fable - I went through a phase of buying dictionaries... Oh and a video (I am so behind the times) box set of ANGEL to complete the nerdiness. Even if it doesn't scream nerdy, there are traces there. 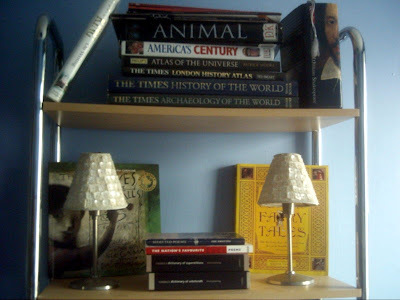 :) Also, I just really like the lamps- very pretty! Wow. That IS nerdy. Not the books. But the near lack of books. And the two little lamps. Some of my shelves are filled two deep with books. And I have two copies of Shakespeare, the Globe Illustrated Shakespeare takes up half a shelf all on its own. Angela - Thanks for visiting, I'm loving looking inside all the other Nerdery's out there. Carylerg - tiny, tiny traces of the nerd. Ed - Yeah, I know what you mean. That bookcase is more display than actually being of any use (it has no sides you see so things fall off). The bookcases in my bedroom are overflowing.